From Jubilee Cake by Alice Wellington Rollins in St Nicholas, Vol. 14, Part II, Scribner and Company, 1887. The illustration is by J. M. Nugent. HER MAJESTY'S JUBILEE CAKE. Months ago tho firm of Messrs Gunter in Berkley Square asked permission of Her Majesty to present her with a jubilee cake, on the plea that fifty years ago the same firm supplied the inevitable cake at the Coronation. A special stand has been built for this giant cake, and standing on a splendid cloth of crimson plush, it is certainly a monument and a triumph of the confectioner's art. The following description of the jubilee cake may serve to give some idea of its size and appearance. The cake is about 9ft. 6in. in circumference, 10ft high, and weighs, without the decorations, over a quarter of a ton. The design represents the crown, guarded by lions, surmounted by a temple bearing figures of Fame and Glory, with trumpets in their hands, heralding the Jubilee to the four quarters of the world. These again are surmounted by temples crowned by a winged figure of Peace, bearing the crown of Empire; the panels of the base, embroidered in gold on white satin, and each of which is worth three guineas, bear the Royal monogram, and between them are figures in relief representing the four quarters of the world. Evening Post, Volume XXXIV, Issue 50, 27 August 1887, Page 1. 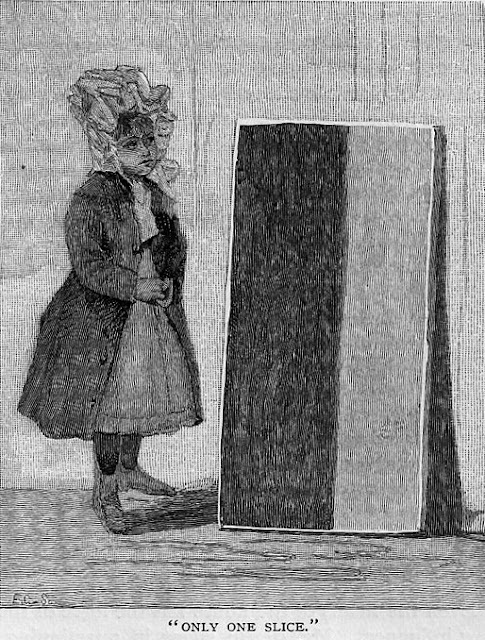 A child with a slice of the giant cake as imagined by J. M Nugent. When I first saw J. M. Nugent's illustration of the cake in Alice Wellington Rollin's article, I was immediately reminded of a confectioner's mould in my own collection which is designed to make two little winged figures of Fame and Glory with trumpets in their hands. 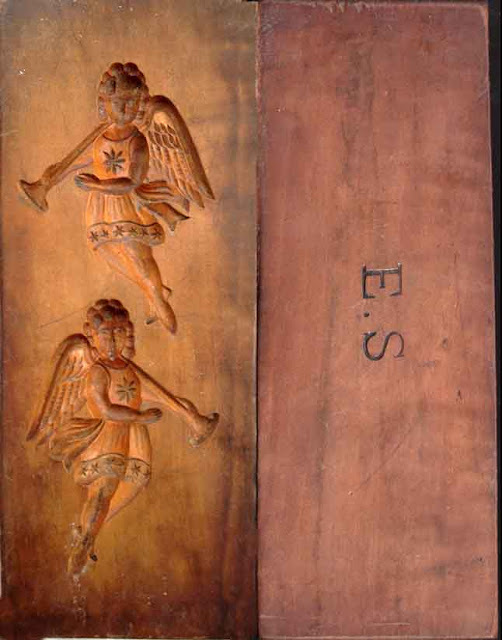 This is one of a number I possess which were formerly owned by the celebrated German cake decorator Ernest Schuble. The mould has his initials on the back. Schuble was working in London in 1897 and I wonder if these figures were designed for a Jubilee Cake he made for that year's celebrations. As well as Gunter's mammoth offering, which was the Queen's official Jubilee Cake for 1887, other confectioners tried their hand at these massive architectural caprices. An article entitled Famous Wedding Cakes in The Harmsworth Magazine (Volume III. 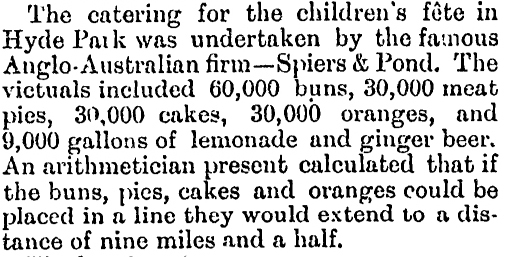 Aug. 1899 - Jan. 1900) includes the two illustrations of Jubilee Cakes below, which are quite different to Gunter's creation. Unfortunately the author Walter St. John does not tell us who made these two impressive cakes. The Queen's Jubilee Cake 1887. This is very different to the cake made in the same year by Gunters illustrated above. The Queen's Jubilee Cake 1897. Like Gunter's 1898 creation, this cake also features winged figures of Fame and Glory. Giant Jubilee Cakes are also a big thing this year. The contemporary London bakers Conditor and Cook are planning to assemble a massive portrait of Queen Elizabeth II out of hundreds of small blocks of gingerbread iced with varying flesh tones. This pixelated portrait will measure 94 square feet and contain over 3120 diamond shaped gingerbread blocks. It will be put together in Battersea Park on June 3rd. You will be able to buy one of its ginger flavoured diamonds for £1. Bettys of Harrogate have made a large, tiered cake based on designs submitted by Yorkshire school children, which is on its way to Buckingham Palace as I write. Jubilee cakes will be thrown again in Abingdon this June. If you visit the museum housed in the old Market Hall, you can see authentic examples from both Victoria's 1887 and 1897 jubilee celebrations. These ancient mummified cakes inform us that the Abingdon Jubilee Cakes were fairly commonplace current buns. They were washed down with plenty of beer. Special beers were brewed for George III's Jubilee celebrations all over the country, an exercise I am pleased to say is being carried out again this year by a number of contemporary breweries. We learn from Preston that the brewers in Towcester, Hadley, Stoneleigh, Northampton and a few other towns, concocted a special commemorative ale, a 'two year old October' especially for the event. The 1809 celebrations were held on October 25th, so the brewers made a special version of their customary October Ale in 1807 and laid it down for two years to mature. 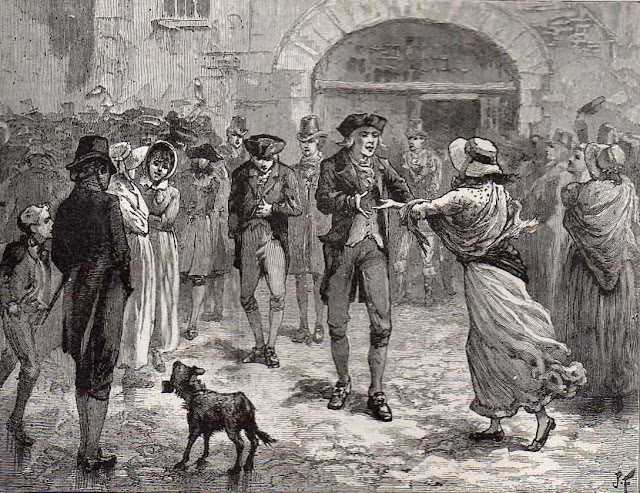 Across the country, similar strong ales were doled out to the poor with an allowance of 'two quarts for a man, one quart for a woman, and half a pint for each child.' Preston also gives us some interesting statistics regarding the number of barrels brewed by the large London brewers in the year 1809-10, as a result of the celebrations a much greater quantity than usual. 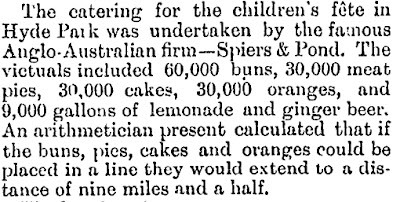 Free buns also featured prominently at an open air party for children in Hyde Park during Queen Victoria's 1887 Jubilee, though by this time, the kiddies' half pint of beer had been replaced with ginger beer and lemonade. Another contemporary newspaper report in far off New Zealand offered some impressive statistics. Jubilee buns like those hurled at Abingdon were plain current buns, while the cakes hidden under the giant Victorian fantasies were made of rich fruit cake. There are very few historical recipes for Jubilee Cake, but here is one Plumcake found which you might like to try. From Favourite Cakes of Rural England, The Cable Series of Farm and Household Books No.2, 2nd ed. contributed by Country Housewives. What did George III have for his Jubilee dinner? According to this satirical print, a pie filled with troublesome baronets! 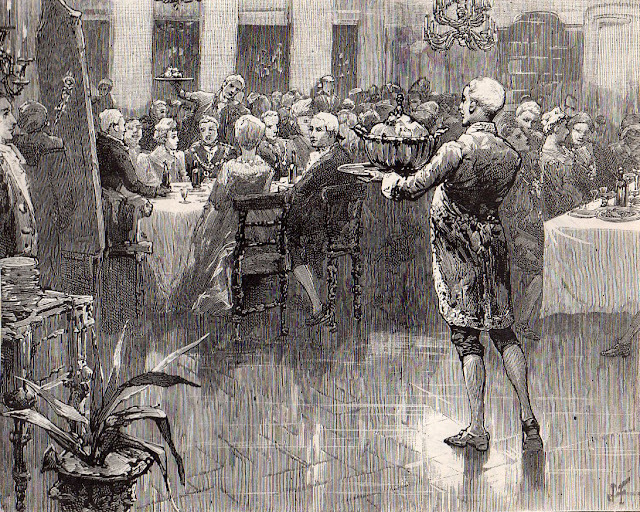 The 25th October 1809 was not a good day for turtles, as many were consumed at the Jubilee feasts of the wealthy. *John Ashton, The Jubilee of George III. The Graphic, April 23. 1887, pp.433-4. Put half a gill of cream and half a gill of water into a stewpan with 2 oz of fresh butter and 1oz of castor sugar, and let it come to the boil; then mix into it 3 oz of very finely chopped almonds; work these well together and let it cook on the side of the stove for about 5 minutes; put four raw yolks of eggs and a few drops of essence of vanilla into a basin and work it well for about 10 minutes, then stir the almond mixture gradually into the yolks, mix well for 5 minutes, then whip the whites of 2 raw eggs quite stiff with a pinch of salt, and mix them into the prepared mixture. Lightly butter and paper a round fleur ring and dust it with castor sugar and fine flour mixed in equal quantities; put a sheet of buttered paper on a baking tin, pour the mixture into the ring and bake for about 25 minutes. The cakes should be a pale brown colour when baked; take them from the oven, remove the paper, place them on a pastry rack, and when cold glaze them with tea glace, and before the glace is set sprinkle the top with blanched and shredded pistachios, and garnish round the edge with desiccated cocoanut. Serve on a dish-paper or napkin for tea or dessert, or a sweet for luncheon or with a compote of fruit or ice. The chopped almonds are better id passed through a sieve. Tea glace:- ¾ lb icing sugar and 1 ½ tablespoonfuls of strong tea and 1 ½ tablespoonfuls of warm water; just mix together, and warm, then use at once. Annie, What an unbelievable coincidence. I am baking three different Jubilee cake recipes at this very moment, including this one of Agnes Marshall's, which are in the oven at the moment!!! The others are Theodore Garrett;s and the recipe above spotted by Plumcake in Favourite Cakes of Rural England. New posting with pictures in the next day or two.